Just like it’s helpful for adults to have written goals, kids do better when they have clear written goals as well. 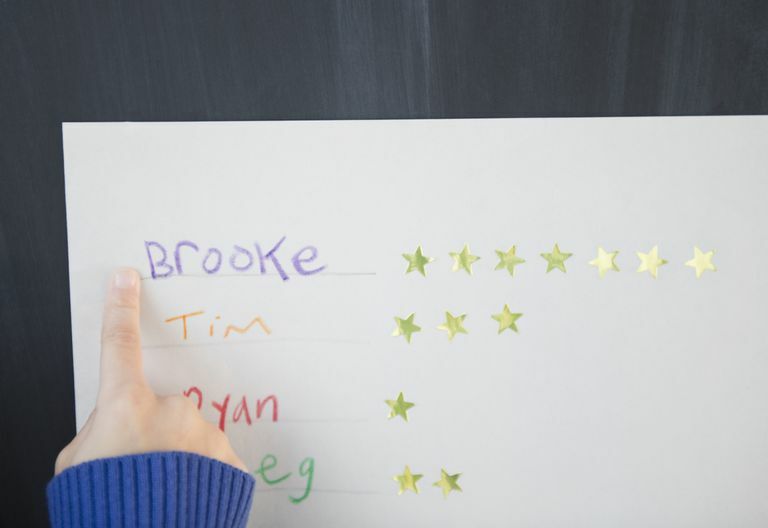 A behavior chart is a great way to give your child a visual representation of his goal. Additionally, it can serve as an effective way to monitor his progress. There are several different types of behavior charts and reward systems that can help you keep track of your child’s behavior. Here are four types of charts that can be especially effective. How It Works: Identify one good behavior that you want to see from your child. Then, when your child exhibits that behavior, place a sticker on a piece of paper. When to Use It: Sticker charts work well with toddlers and preschoolers. Usually, the sticker is reward enough for them. Try using a sticker chart with new behaviors that you want your child to learn, like potty-training or picking up toys. How to Make It Most Effective: Let your child pick the stickers that will go on the chart. Hang the chart in a prominent location. Your child will most likely be proud of the stickers he’s earned and he’ll want to make sure everyone sees it. Common Traps to Avoid: Don’t overcomplicate a sticker chart. You don’t need to draw out days of the week or turn it into a calendar. Young children don’t care whether they earned a sticker on Tuesday or Thursday. Use a brightly colored blank piece of paper with colorful stickers and stick to one behavior that you really want to address at a time. How It Works: Create a list of chores. Then keep track of each day your child performs each chore, like making his bed or cleaning his room. When to Use It: A chore chart can help children of all ages become more responsible. Your child will be more likely to get his work done when there’s a clear list of chores right in front of him. Use a checkmark to note when each chore is complete. How to Make It Most Effective: Tell your child he can earn privileges--like electronics time--by completing his chores. Or, use it as a way to keep track of how much allowance he has earned each week. Common Traps to Avoid: Avoid nagging your child to do his chores. Instead, make it clear that it’s his responsibility to do his work if he wants to earn privileges. How It Works: Make a schedule that outlines your child’s routine. You may want to make a morning routine, an after-school routine, and an evening routine chart. Include things like homework, teeth brushing, getting dressed, putting pajamas on, and other daily tasks you want your child to do independently. When to Use It: A clear schedule will help a child of any age become more responsible. A simple chart for a preschooler may include two or three things that will help him get ready on his own in the morning. A routine chart for an older child may signal when it’s time to do homework and when it’s time to put away electronics for the night. How to Make It Most Effective: If your child struggles to read, use pictures to depict each activity. Hang your routine chart in the area where your child will need it most--perhaps his bedroom or the bathroom. How It Works: Identify the behavior you want to see more of and write it on the chart. Rather than saying, “No hitting,” say, “Using kind touches.” Then, each day you see the desired behavior, mark it on the chart with a sticker, checkmark, or smiley face. If your child is really struggling with a specific behavior, break the day down into time frames, such as morning, afternoon, and evening. How to Make It Most Effective: Allow your child to trade the checkmarks in for larger rewards. For example, tell your child he can earn a trip to the park when he has five checkmarks. You may also want to consider using a token economy system. Common Traps to Avoid: Don’t expect perfection. If you tell your child he needs to get a checkmark every single day, he may give up easily if he’s not performing well.